On our third day in Tasmania we drove further down the East Coast to the Freycinet National Park. 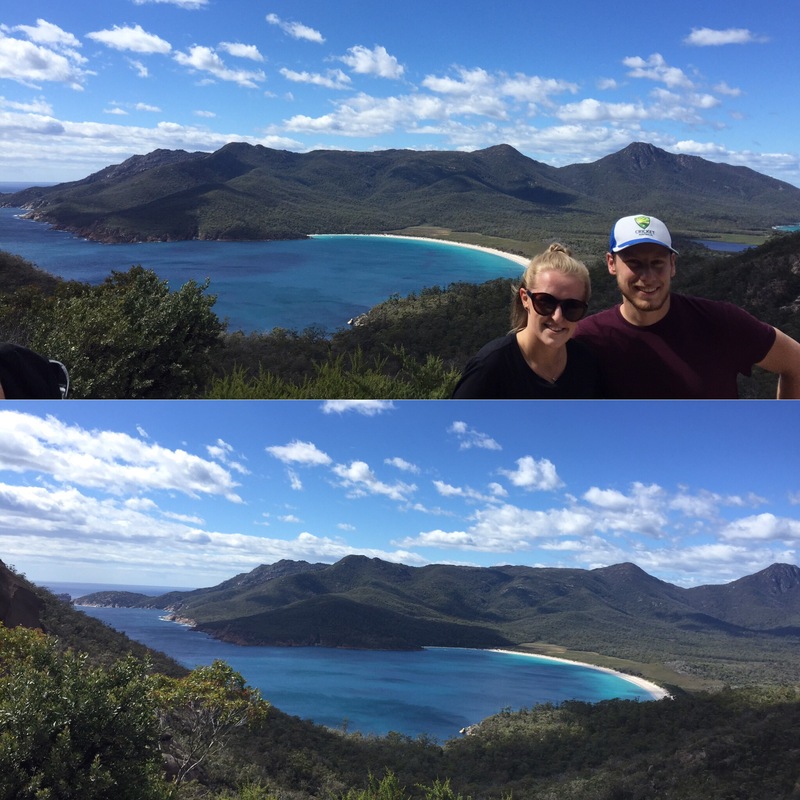 This has one of Tasmania’s most iconic views – Wineglass Bay. From here, we would be travelling to Hobart and so we had made lots of food and had our bags packed in the car as well. Just as we parked the car in the National Park car park (we were there at around 10ish so before it got super busy to try avoid the crowds from bus tours) we saw a wallaby! 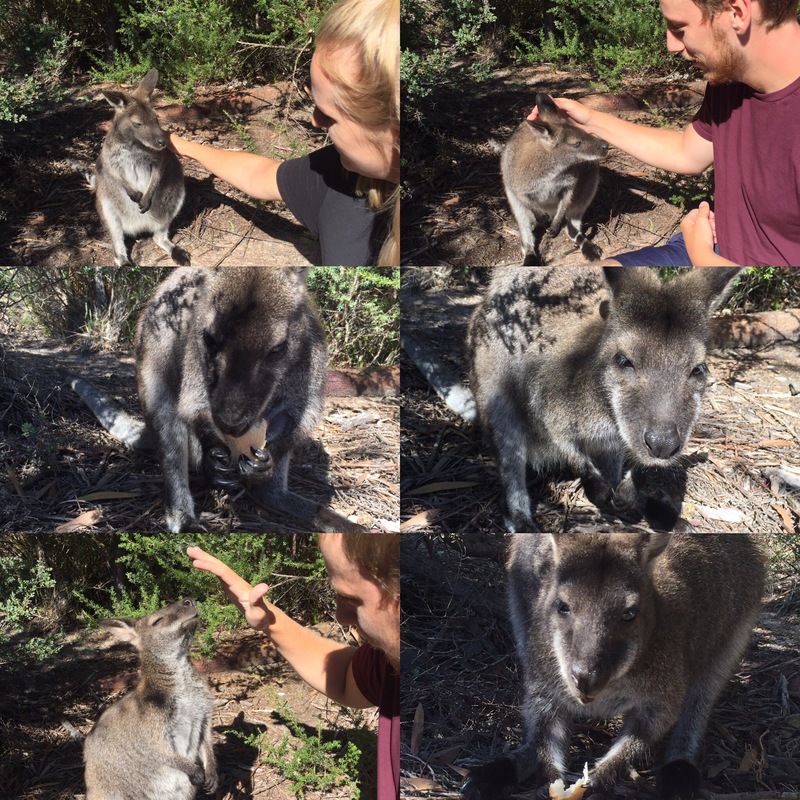 We used some of our lunch to bribe the wallaby to come closer and spent a little while feeding the wallaby and giving it a stroke. We don’t think we’ll ever get used to seeing kangaroos and wallabies in the wild and it always makes our day that little bit better when we get to see one. It was very cute, especially when the food had run out and it was trying to get us to give it some more! 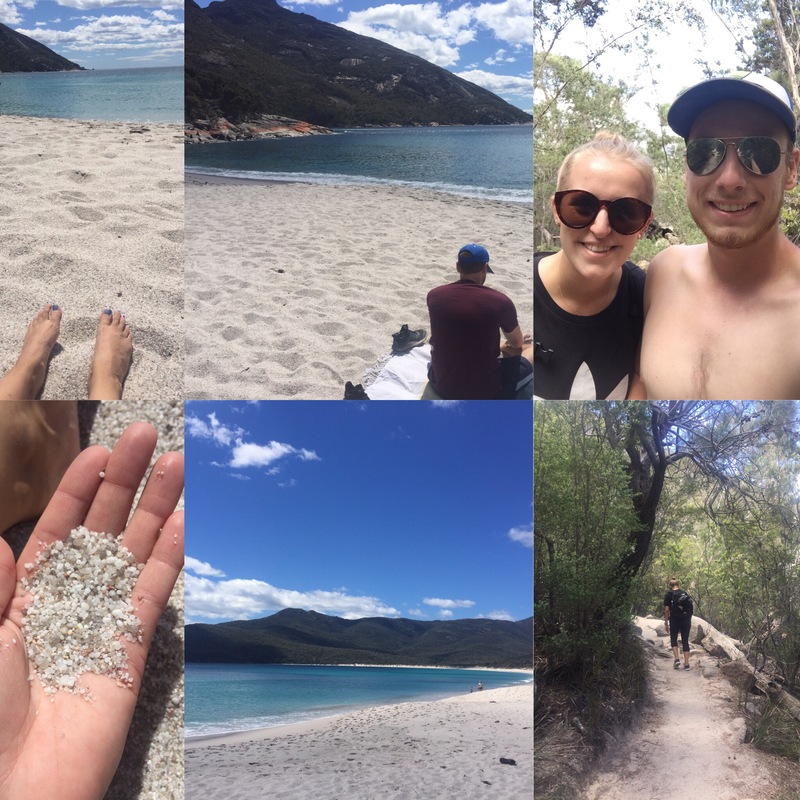 The hike up the mountain to Wineglass Bay lookout was around 45 minutes. It was a sunny day so quite hot and for some reason (considering the amount of walking and hiking we have done so far) I found the walk up really challenging. I was glad to get to the top and the views definitely made it worth it! It’s incredible that the water can be so turquoise – it’s more what you would expect from somewhere in Asia! After admiring the view, having our lunch and me catching my breath, we headed back down the mountain to go to the Bay itself. This was on a different path just off from where the lookout was and took around 25 minutes to get down to the bay but longer on the way up. The walk down to the bay is mainly stone steps and boulders that lead down to a very fine stone beach (not as fine as sand but still comfortable to walk on and means you don’t get the annoyance of getting sand everywhere!) We spent hours relaxing and sunbathing in this beautiful bay which only had a handful of people there (not everyone bothers with the walk to the bay or just comes for a quick walk and leaves again). I would definitely recommend this part of the walk if you have the time and nice weather! One thing we hadn’t realised (which is very important to note) is that there is nowhere to get water once you start the walk and if you’re going to end up spending hours on the beach like we did then it’s important to have plenty of water with you – we were very thirsty by the time we got back to the car and raced to the visitor centre to refill our bottles a couple of times to rehydrate! 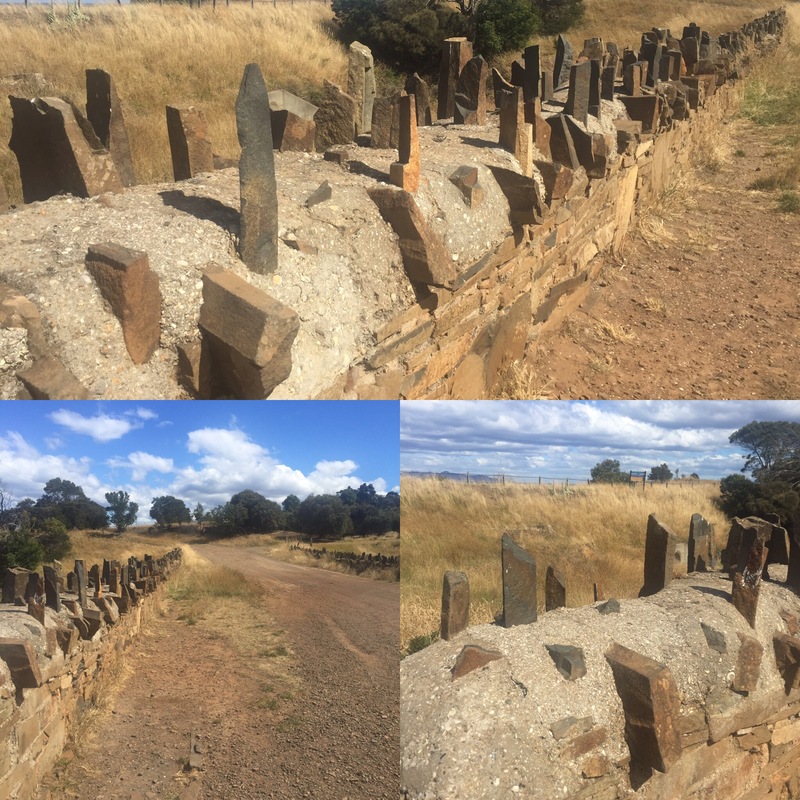 Our drive to Hobart was pretty uneventful apart from a short stop at The Spiky Bridge which was built by convicts in 1843 to link two towns, Swansea and Little Swanport. The bridge wasn’t the only thing that they built as the whole motorway that links the two towns also needed to be built – you can still drive over it as a little detour but the main road now runs along side it instead. That evening we just relaxed in our hostel (The Pickled Frog). 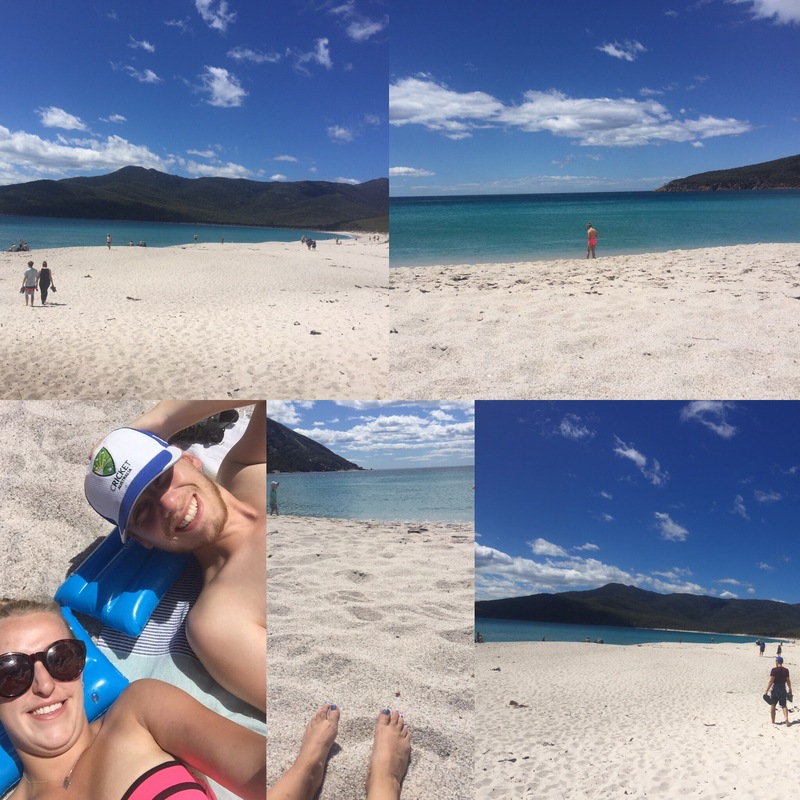 Wineglass Bay and the Freycinet National Park is a must see if you’re visiting Tasmania.